Combining Lean Construction thinking (in the shape of Last Planner approaches) and BIM (Building Information Management) on construction projects can enable big reductions on time, cost, waste and stress, and in doing so improve profits, capability, staff wellbeing and reputation. 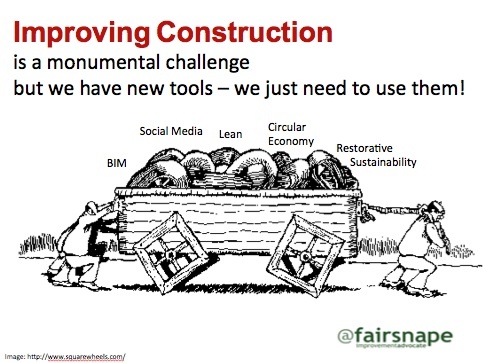 Improving construction: we need to swap out the inefficient square wheels of yesterday for todays round wheel thinking. My recent ‘Lean BIM’ lecture at Leeds Beckett, explored and discussed with case studies, how achieving the 30% construction strategy cost saving target is within reach. Lean thinking and last planner approaches should be seen as collaborative working preparation for BIM. Both share similar aims – ‘producing the right product at the right time in the right quantity for the customer and to produce exactly what you need and nothing more’. BIM in conjunction with lean construction (ie Last Planner approaches) can get construction activity closer to the Honda expression of “everything we do … goes into everything we do” (Currently only 40-60% of what we do in construction goes into what we do, ie what we get paid for or hand over to our customers). BIM, like lean construction thinking forces us to focus on the end game first, understanding client value and pulling that value through design and construction. BIM, like Last Planner will reduce firefighting and stress on project management team. BIM will drive lean and predictable programming and material sequencing. BIM will streamline the supply value stream for materials, enabling just in time supply, adding value and reducing unnecessary costs. BIM and Lean construction both need construction leadership at organisation and at project level. Contractor core processes (eg design and construction) need to be shaped around Lean Thinking and BIM requirements. Early contractor and supply chain involvement with strong collaborative culture must be in place. This entry was posted in comment and tagged BIM, collaboration, construction, last planner, lean, Lean BIM, lean construction, Leeds Beckett Uni, TQM, waste on November 10, 2014 by martin brown.